I’m now heading to the city of Durango, the state capital. 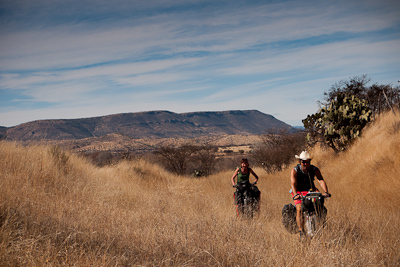 I’m still trying to keep to dirt roads where possible, with the rest of the dirtbag crew – Jeff, Jason and Anna. It’s some time since we’ve bumped into any other cyclists, let alone foreign travellers, as the route we’ve chosen is one that’s rarely travelled. Yet despite some security concerns in this narco riddled region, and its ferociously buckled topography, it’s one I’d recommed highly. 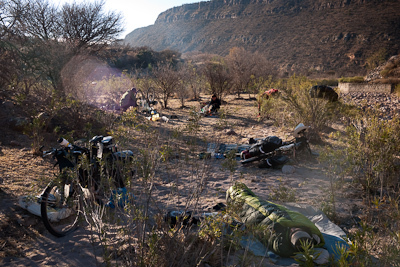 If you really want to get into Mexico’s backcountry and escape its busy main roads, it’s well worth the effort to seek out ‘terraceria’, as dirt roads are called here. 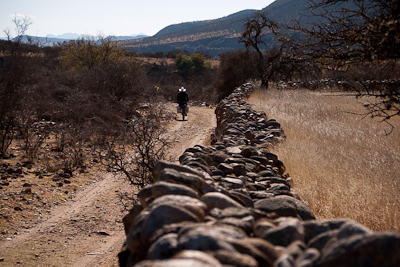 Our fortuitous encounter with Abrahim had unearthed a new route heading south towards Durango. Not on the main road, as we’d feared, but following a disused old mining railway that ran parallel to it. We had it to ourselves. And it was flat! 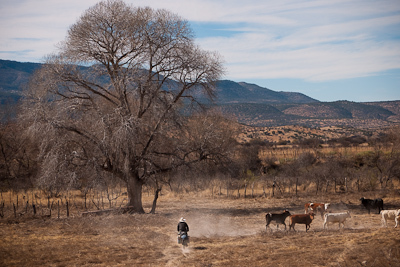 After weeks of toil, such relaxed riding was a novelty – and very welcome. 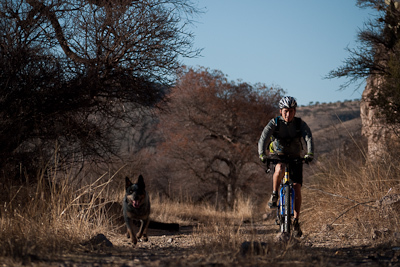 Abrahim, and his Australian blue heeler, joined us for the first part of the ride. Camping out in a dry orillo. No need for tents, though I did ponder the fact that Durango’s state symbol is the scorpion. The sting of the Alacran, a deceptively small little critter found only in these parts, can be lethal. A very mellow ride indeed. We were stoked. Thanks Abrahim for your help. Jason sports the latest in somebrero fashion, as he crosses one of the railroad bridges, a remnant of the days when the railway was used to transport deposits from the mines in the mountains. Los Corrales – now a forlorn station along the tracks. 192 flat, quiet kilometres, right into the heart of Durango! Awesome. Or so we thought. Unfortunately, after some time, the trail became increasingly overgrown. Until it shrunk down to a thin, grassy band of singletrack. Which gave way to railway sleepers, which had yet to be removed. Eventually we were forced to retrace our steps, manhandling the bikes over the rails, to a path leading towards the river and down to a village. Then we spotted some singletrack across a field, sending a herd of cows galloping off in confusion, kicking up clouds of dust. Fording the river at a low point, we rejoined the main road to Santiago. The railway path had been amazing – such a shame it was over. Maybe one day the local goverment will pull up the rest of the sleepers (or, as tends to happen round here, locals will ‘recycle’ them). If it was cleared, it would make a fantastic, traffic and almost flat ride to Durango, that could really promote cycling in these parts. 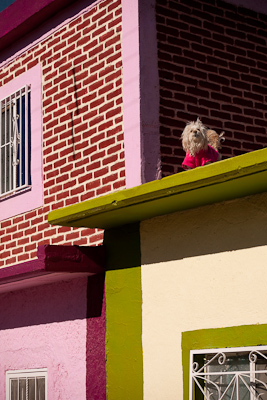 More Mexican colour co-ordination from this yappy little pooch. Winding our way through one final labyrinth village, we emerged back onto the main road to Santiago Papasquiaro. Distance: just 55km or so. 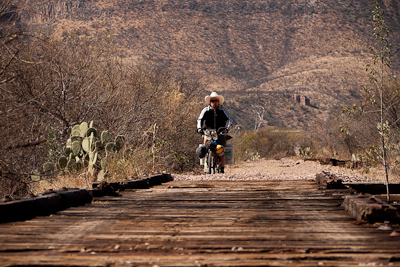 Navigation: You have to cross the bridge in Tepehuanas to join the old railway line, which offers 35 kilometres of mellow riding to Los Corrales. Perhaps it’s possible to go further with more determination, as the sleepers might have been plundered further down the way. Road conditions: Mainly flat and mellow, with a few stoney sections and later, one or two gates to clamber over. Watch out for thorns. Inner tube goo recommended. Some riders here make it out of local plants! Food: Nothing until you join the pavement, then there’s the opium den of Hereras shortly before the larger settlement of Santiago – a characterful town of some 25 000 people. 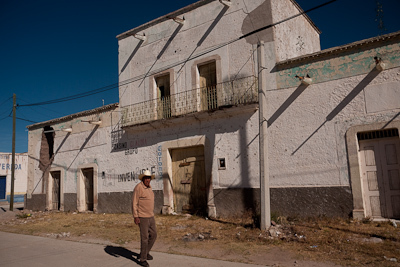 This entry was posted in Mexico on February 5, 2010 by Cass Gilbert. Same here Cass with that final shot. And love the sombreros as well. Still been reading all the posts. Just awesomeness. 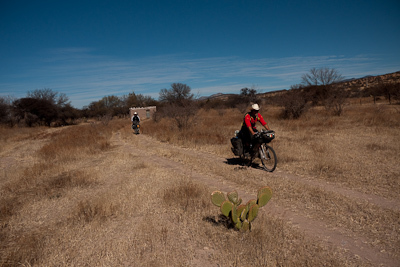 Nice to see this pictures I’m actually from Tepehuanes, and it’s refreshing to see tourists have a nice time biking! The 4th picture down is from El Presidios, nice to see my town, I grew up there and have a house there too. =). Thanks for the pictures and the blog. Thanks very much for the comment. 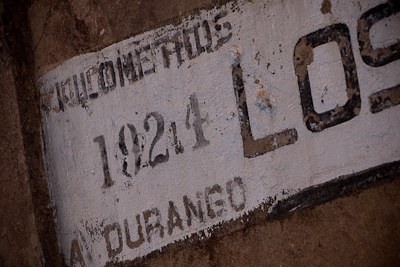 We had a great time in Tepehuanes, and riding along the disused railway towards Durango. Awesome pics! Looks like they didn’t get a lot of rain this season. As a child, I would anticipate the sound of the train whistle. It meant we only had seconds to run the the train station to watch it go by. Did you experience the hot springs in La Candela? I enjoyed all the beautiful pictures although I am kind of sad to see the Los Corrales train station without the railroad tracks in front of it. As a child growing up in Corrales, I used to go la casita del tren (the train station) as we used to call it all the time. 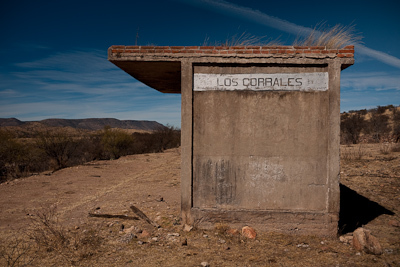 Did you guys take a bath at “los toros” – a hot spring on the side of the railroad in between Sandias and Corrales? I used to go to los toros as a child for my weekly baño(bath). I remember those days. We used to take a trip to los toros just to bath our selves. This trip happened only on weekends, to be more certain, on Sundays. Great memories and this is a great story. 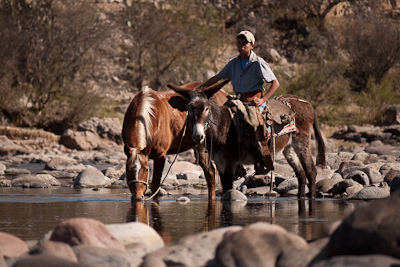 Looks awsome guys great pics., You shoulld try the “posos” in the town of Sandias near the river or in the town, they will sure help relax the muscles.